Way back in the day, when Kansas City avenues were “lined with jazz clubs, street bands and folks harmonizing on every corner,” a talented little musician named Melba Liston was born. 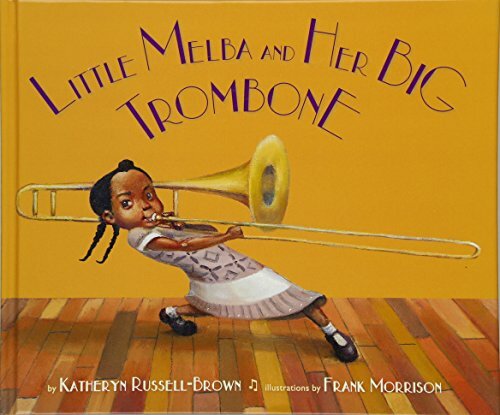 This September, her story plays out in an eye-catching new picture book called Little Melba and Her Big Trombone by Katheryn Russell-Brown. In the book, little Melba spends her days and nights dancing to the notes and beats and rhythms and lyrics in her mind that no one else can hear. When she’s old enough she makes the trombone her musical instrument of choice. The instrument is so long her arms can barely stretch enough to handle it, but that doesn’t stop her from mastering it. In fact, by the time she is eight years old, little Melba is already playing on a local radio station! When Melba and her mother move to Los Angeles to begin a new life, Melba sticks out like a sore thumb among the other children her age. Her academic prowess convinces her principal to skip her ahead from the sixth grade to the eighth, and her musical genius leaves the other students in her after-school music club in the dust. Melba is so good on the trombone that the boys in the music club are soon calling her bad names. Like any child wanting to fit in, Melba is hurt. Still, she ignores them, pushes ahead, and experiences many great adventures, including touring the country with an all-male band, composing and arranging music that “mesmerizes the crowd,” and eventually performing with jazz greats like Quincy Jones, Duke Ellington, and Dizzy Gillespie. Little Melba and Her Big Trombone is a finger-popping slice of history that offers a peep-hole into the little-known world of a female jazz players of the 1920s. The prose is fast-paced, lively, and factual and is written in a way that inspires the admiration of both children and adults. The rich and diverse storyline can serve as a jumping off point for discussions about musical and academic genius, gender stereotypes, the jazz movement, jazz as an art, 1920s Kansas City, and prominent African Americans of the 20th century. For the picture book lover, artist Frank Morrison’s illustrations are a superb blend of fluidity and motion, and every character he highlights seems to be dancing right off the page. Each sketch’s backdrop is rich with vintage details about early America, and kissed with shades of burnt orange and honey brown that lend a sleek and jazzy feel to the pages. In fact, his scenes are wistfully reminiscent of those glorious, elongated, hip-bone-in-motion sketches by famed artist Ernie Barns that captured the world’s attention when they were featured on a comedy called Good Times, a groundbreaking 1970s television show.